Thinking robots that is. For the first time ever, a computer allegedly passed the Turing Test. What is the Turing Test, you ask? Well, it was a test developed by Alan Turing, a genius British computer scientist to determine if a computer may be able to think. 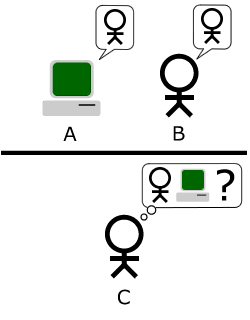 In the test, a judge (person C in the graph above) must determine if the person/thing they are conversing with by text with is a computer or a person. If a computer tricks 30% of the judges, it passes the test and the idea that it is a ‘thinking machine’ is no longer contradictory. While the Turing test does not measure intelligence and rather focuses on mimicking human behavior, it is still an important first indicator of the advancement of super computers and how humans interact with computers. The everyday use of thinking machines has been explored in many science fiction films and literature, and now that they are becoming more of a reality, it may be a good time to start seriously talking about their practical uses and moral implications. You can read more about Eugene Goostman passing the Turing test here. Well said, depression, well said.